Regulators in the former colony have spent five years tightening mortgage controls, but real estate prices are still rising. It’s a reminder not to expect too much from “macro-prudential” policies. Authorities can stop banks from lending too much. Deflating a bubble is trickier. BIS paper: Can non-interest rate policies stabilise housing markets? Hong Kong on Feb. 27 took fresh measures to cool one of the world’s most expensive real estate markets, stepping up a five-year campaign to restrict excessive borrowing in the former colony. 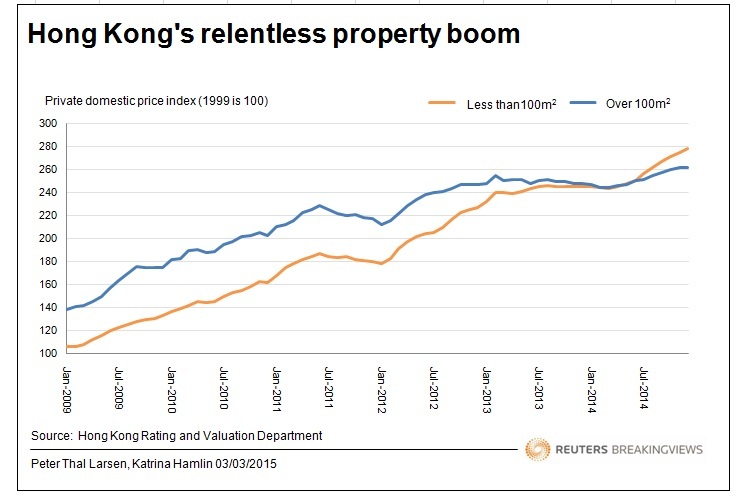 The Hong Kong Monetary Authority cut the amount of money homebuyers can borrow to 60 percent of the property’s value. Buyers of homes worth less than HK$7 million ($903,000) had previously been allowed to borrow up to 70 percent of the value of the home. For second-home buyers, maximum monthly mortgage repayments will be lowered to 40 percent of their income, from 50 percent. The HKMA also said that banks which use their own models to calculate capital ratios would be required to apply a minimum risk-weighting of 15 percent to all residential mortgages from June 2016. The provision previously applied only to new loans. “It is the duty of the HKMA to introduce further measures to safeguard the stability of the banking and financial system given the renewed signs of overheating in the property market, particularly the small-sized residential units,” said Norman Chan, chief executive of the HKMA. The Hong Kong government’s index of residential home prices reached a record of 277.6 last December, 13 percent higher than a year earlier. Hong Kong Financial Secretary John Tsang on March 28 said prospective homeowners should worry about affordability in years to come. “If it is not affordable, then don’t buy a property,” he said according to the South China Morning Post.